LA Photo: Anti-Gay Protest Outside Fairfax H.S. A very small gathering of anti-gay protesters from a Kansas based church, Westboro Baptist Church, picketed outside Fairfax High School. The church members are upset over Fairfax's student body choice for prom queen, 18 year old Sergio Garcia a gay male. 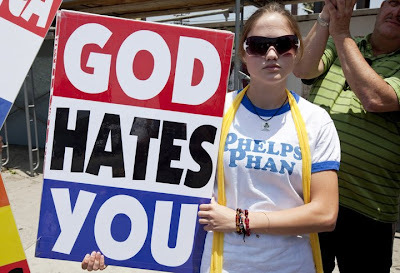 The church is infamous for protesting at the funerals of US soldiers, stating God has killed them because he is angry with America's tolerance of gay and lesbian people. The counter protest and police presence greatly outnumbered the church members.